Matt Collins is a freelance writer and Head Gardener at the Garden Museum in London. 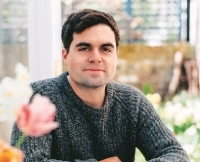 Trained at the Botanic Garden of Wales, Matt contributes articles on horticulture, wildlife and travel for magazines and journals such as The Guardian, Hortus, Slightly Foxed, Caught by the River and a regular column for Toast Magazine. He has published several books for the publisher Pavilion Books, including his most recent, FOREST, Walking Among Trees. Garden/nature journaling, podcasting, wild swimming and fly-fishing.